Bigger doesn’t always equal better, but it’s actually accurate when it comes to televisions. If you wish to make an investment in your home entertainment, the best solution is to upgrade the current TV screen to a bigger model. The 70-75” range represents a sweet spot for comfortable viewing of any movies and TV shows or for a premium gaming experience. In this article, we’ll focus on 70-inch and 75-inch TVs which bring the best value for the money. Those who have large living rooms can benefit a lot from getting such a large-screen TV. Older televisions can look way too small in large homes so upgrading to a more comfortable diagonal size is the obvious solution. While many big-screen televisions can fulfill your needs, some are better equipped in terms of image performance and other extra functions. To choose the correct 70-75” TV you need to figure out if it matches your entertainment needs. We’ve put together this list of products to aid you in your decision. Some models are suitable for those with budget limits while others are recommended if you want maximum picture quality and overall performance. Here are the best 70” and 75” televisions for the cost. You might also be interested in our articles about the best curved TV and the best futons. If you’re in the market for large TVs, one of your first options should be the Samsung UN75NU8000. This model comes from Samsung’s UHD 8 Series and its screen measures 75 inches. This flat-screen LED TV features many interesting abilities for a more enhanced image with vibrant, natural colors. The TV packs all the recent technologies developed by Samsung to maximize the picture quality to extremes. Seeing different layers of brightness is possible with the help of HDR10+ and the UHD engine promises a new level of crisp clarity. When it comes to action scenes, this 75-inch television offers fluid movement thanks to the Motion Rate 240 technology which can truly create an immersive movie experience. Another aspect that’s been improved over the older generation is the Smart set of capabilities. Enjoying your favorite content is now easier and anyone can learn to take command of the TV’s features using the intuitive OneRemote or through Bixby voice control. There are lots of great abilities that make the Samsung UN75NU8000 a strong competitor in the world of large 75-inch 4K TVs. It’s great that this solid level of picture quality is also available at a reasonable cost. Sony is a very reputable electronics manufacturer and their premium 4K TV lineup deserves some more attention. One model that can be the right fit for large living rooms is the XBR75X900F, a Smart 75-inch unit with some impressive qualities. X-Motion Clarity, HDR Gaming, and Triluminos picture quality are just some of the highlights. Before checking out the image performance, it’s important to observe the fine details of the sleek and elegant construction. The narrow frame of this television makes it blend more seamlessly with the surroundings and the aluminum finish makes this one of the most beautiful TVs you can get. When it comes to the quality of the picture you will most likely be amazed. The 4K HDR X1 Extreme handles the image processing duties and delivers every scene with utmost clarity and smooth detail precision. For realistic colors, the Triluminos display makes use of Super Bit Mapping for a vivid experience no matter the content. Other great features are the nice PlayStation integration for competitive gaming and the minimal blur even during intense action scenes. It’s also nice to see the voice control flexibility which enables users to rely on either Google Assistant or Amazon Alexa. 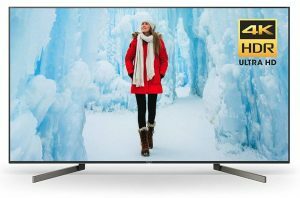 All in all, the Sony XBR75X900F is a very high-quality 75-inch television and it’s recommended if you have the budget. Samsung’s latest 8 Series of 4K TVs contains some capable QLED models like the QN75Q8F. This 75-inch model is definitely not for everyone’s budget, but it easily represents the ultimate in terms of visual home entertainment. With the help of state-of-the-art technologies and due to its exquisite design, this model can satisfy users that need a premium TV to fit well inside a large modern home. The first thing that attracts attention is the bezel-free design of the television. It allows you to watch your movies in a full-immersion style and the clean look adds a premium touch in any room. Performance-wise, this TV is packed with amazing Quantum Dots abilities including a powerful Q Engine processor to optimize any scene up to 4K standards. The depth of the colors, contrast, and detail certainly needs to be experienced in real-life as this model has the potential to blow you away in terms of picture quality. When it comes to controlling the TV, it looks like Samsung made no compromises on Smart features. Aside from the Bixby voice assistant and OneRemote, there’s also a convenient Universal Guide and a dedicated smartphone app. 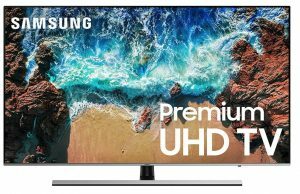 In conclusion, the Samsung QN75Q8F can easily be considered the best choice for a 75-inch TV, but the cost makes it not so appealing for budget-conscious users. LG is another manufacturer that has some performant 4K 75-inch TVs to offer. One particular model that boasts an excellent value for the money is the 75UK6570PUB. 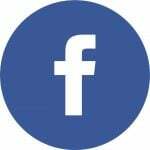 It provides support for HDR10 and HLG while its quad-core processor does a range of powerful tricks to ensure the picture quality is consistently superb. 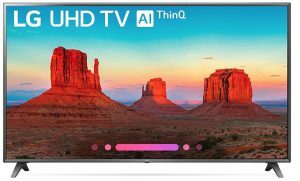 As this television has been equipped with AI ThinQ, you can take advantage of some of the best Smart features available. It turns the TV into a powerful Smart hub for your devices enabling the user quick and intelligent access to loads of apps and content. Thanks to the scene-by-scene optimization, this TV has great potential for watching movies and TV shows with accurate details and vibrant colors. The 4K HDR performance of this television does a solid job when combined with the advanced tone mapping technology. You can enjoy lifelike movements and colors on the screen. The 75-inch size definitely helps to expand your entertainment. Another great feature is the flexible connectivity. You can connect up to 4 HDMI devices and there are also USB, RF, and Composite connectors. Overall, the LG 75UK6570PUB shouldn’t be overlooked by any fans of large-screen 4K Smart TVs. 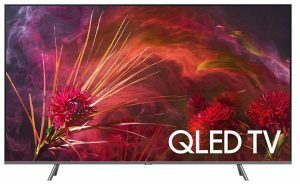 Even though it comes from the 6 Series of UHD TVs from Samsung, the QN75Q6 represents a reliable option if you wish to get your hands on a premium QLED 75-inch TV. 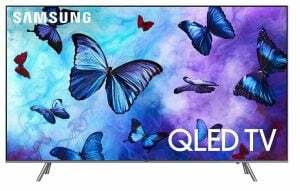 There are many people who wish to step into the fascinating world of QLED where every detail and every scene looks exquisitely clear and vibrant. The Quantum Dots technology has the potential to create more than a billion shades with higher color volume to redefine visual entertainment. With so many colors, contrast depth becomes an important aspect and this is where the Q Contrast technology comes into play. Whether we’re talking about the darkest or the brightest scenes, they all look consistently brilliant regardless of lighting. One important reason to consider QLED TVs is that they’re way more durable in time as normal LED screens can show some signs of aging like less vibrant colors. While this TV can revolutionize your home cinema experience, it also has many other features to make it a versatile addition to the living room. It can blend with the décor through Ambient Mode and can act as an information hub, personal photo gallery, and music streaming solution. To conclude, the Samsung QN75Q6 brings a lot of value to the table so it’s recommended to save a bit more for a QLED screen rather than getting a cheaper normal LED. Samsung is the leading force in the world of large 4K TVs and another model of theirs with great potential is the QN75Q7F. As its model name suggests, it features a 75-inch screen size which can be perfect to create a more comfortable viewing experience in larger living rooms. It comes from the UHD 7 Series promising a nice balance between lifelike picture quality and cost. The Q Contrast Plus technology is one of the most impactful when it comes to ensuring that blacks remain deep and the bright screens have a lot of depth. For a burst of colorful details, you can rely on the Q HDR Elite which allows you to see movies very close to the way the director intended. It’s safe to say that you won’t be disappointed by the picture quality. Other aspects that make this model worth considering are the advanced Smart features and the elegant design without unsightly wires. If you plan on mounting the TV on the wall you will definitely be pleased by the Ambient Mode which takes advantage of the sleek design of the screen to seamlessly incorporate it into the room. Reliable and performant in terms of image quality, the Samsung QN75Q7F is worth every cent. 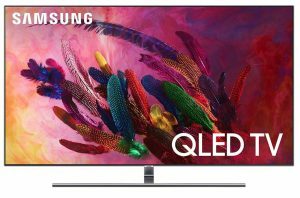 You can’t go wrong if you purchase a QLED UHD model like this one. In case you wish to get your hands on a 70-inch 4K TV, take a look at the LG 70UK6570PUB. This is the latest 70-inch model from LG which comes loaded with powerful features at a slightly reduced cost compared to 75-inch units. Those 5 extra inches won’t make a huge difference to your visual satisfaction, so this TV seems like a good compromise if you’re on a budget. 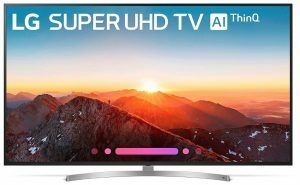 Of course, even if the cost is more affordable, this model is still a premium 4K TV and some of the latest technologies like the advanced AI image processing are present here. 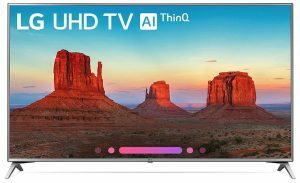 Speaking of artificial intelligence, this TV features the capable AI ThinQ that lets the unit act as Smart entertainment hub. All your favorite content is accessible through an intuitive Smart interface and if you don’t like the idea of getting the LG Magic Remote, there’s always the option to use the voice assistant feature. Regarding image quality, there’s nothing to complain about the stunning visual clarity. This TV has a focus adding dramatic depth to every scene as it’s capable of enhancing the brightness using the Ultra Luminance feature. Considering how it offers solid image quality at a more reasonable cost, the LG 70UK6570PUB represents a good potential option if you want to benefit from a brilliant and sharp visual experience. The LG 75SK8070PUA is a nicely designed 75-inch TV which boasts some of the latest innovations in the industry. Aside from the sophisticated image processor built for supreme HDR quality, this model also features LG’s AI ThinQ that can suit well any fans of Smart devices. It makes use of advanced artificial intelligence technology to allow the user to command the TV’s functions and integrate other Smart devices. Thanks to the capable α7 intelligent processing unit, this TV delivers lifelike picture quality with incredible sharpness and superior color accuracy. To boost the cinematic experience to new levels, this TV makes use of a Nano Cell Display with an expanded color gamut. You can benefit from support for all the HDR formats like HLG and Dolby Vision HDR. One aspect that’s often overlooked when it comes to the competition is the sound quality. This TV relies on the Dolby Atmos technology which delivers a solid surround sound effect that combines nicely with the visual qualities. With 4 HDMI ports and lots of other connections, the LG 75SK8070PUA should cover anyone’s needs. For its cost, this large 4K TV deserves a mention on this list of best 70-75 Inch televisions.